Avner Eisenberg in Exceptions to Gravity is a reminder of the theatrical power that can reside in a single charismatic performer who touches the heart. A master of the art of physical comedy, Avner weaves a spell of poetic simplicity in a show of hilarious predicaments. Avner has appeared on and off Broadway with his hit show Exceptions to Gravity. He played the endearing Holy Man, The Jewel, in the Michael Douglas film, The Jewel of the Nile, and performed as a ventriloquist on Broadway in Ghetto. His dummy was nominated for a Tony Award. Avner’s show defies the barriers of language and culture and has toured extensively in the US and abroad. Avner The Eccentric is a brilliant comic…hurt yourself hysterically funny. I laughed for 2 solid hours. The show only lasted an hour and a half. If you are feeling low, take two hours of Avner for comic relief. 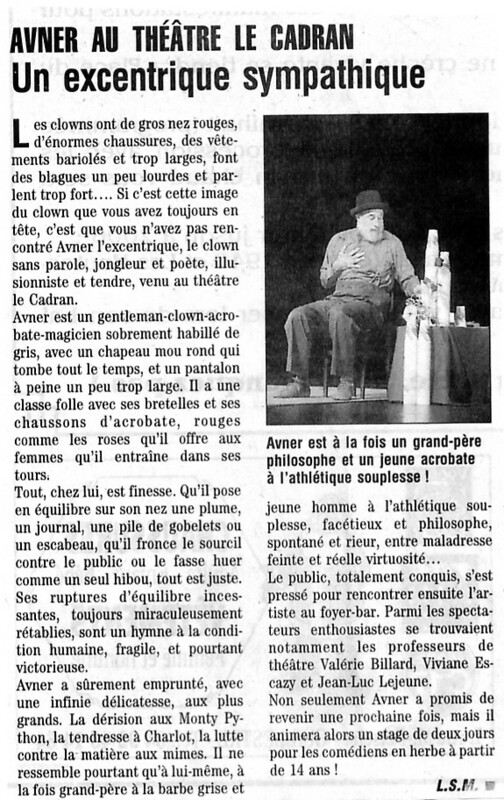 Here is what Avner the Eccentric does best: he reduces his audience to laughter and giggles and applause. Astonishing and funny. A clown for the thinking man…Avner the Eccentric leaves you hungry for more. If you miss Avner, you’ll be sorry and your life will turn to ashes, and it won’t be my fault because I warned you. So, maybe after all is said and done, he’s actually a physician. At the very least, it’s certain that if you have the chance to experience a performance by Avner the Eccentric, you’ll come out feeling a lot better than when you came in. Avner the Eccentric makes hard things look easy and easy things look impossible. In short, he’s a master clown…truly is something to see. …applause for this magnificent artist. I was completely enthralled. It’s not easy for a single performer to keep an audience giggling, chuckling and even guffawing for an hour and a quarter without saying a word, but Eisenberg makes it appear seamlessly simple. If you missed him this time, don’t let it happen again. He is agile and ingenious in his use of humor. Avner is incredibly graceful and his stunts are stunning. Don’t miss him. It is physical comedy at its finest. Best of all, there are no age, gender, or language barriers. The humor is simple and Exceptions To Gravity is simply fun for all. Avner Eisenberg is A bald charmer in red suspenders, Avner is ultimately triumphant in his ongoing battle with any number of inanimate objects; indeed, his props—in cahoots with varying physical forces, including the title one—appear in the course of an hour and a quarter to stage a massive serial insurrection, which the clown puts down with agility and patience. Certainly he earns the audience adulation that he proceeds to conduct as if it were a guffawing symphony. Avner is very good at what he does. A reminder of the theatrical power that can reside in a single charismatic performer who touches the heart, Avner held the audience entranced. If laughter really is the best medicine, Avner Eisenberg could easily cure everything that ails you. He’s a clown in the truest sense of the word…You’ve got to see it to believe it can be this much fun. Avner works without music, but he makes music with his body. Absolutely unique and hilarious, like we’ve never seen before. Knocked us out with his surprising and vital performance. Avner played the title role, The Jewel in the 20th Century Fox Feature Film The Jewel of the Nile starring Michael Douglas. The performance by Eisenberg, who is a true comic discovery…is very wise and very innocent. Some of his best moments involve his bewildering cross-cultural dialogue. Avner Eisenberg is the most intriguing comedy discovery in a long time. The stand-out performer is Avner Eisenberg as the title character (yup, the “Jewel" is in fact a bloke) with some great comic touches. There are…some great moments, and the standard of comedy is again high, thanks predominantly to Eisenberg. Avner Eisenberg very nearly steals the film. L’excentrique…un véritable chef-d’ouvre de drôlerie. Tout, chez lui, est finesse.... toujours miraculeusement rétabiles, sont un hymne à la condition humaine, fragile, et pourtant victorieuse. …a major role is that of the Janitor, played by the ineffable Avner Eisenberg. This deadpan honorary Karamazov begins the evening by littering, sweeping and littering the stage. As he merrily warms up the audience, he sets the show in a circus context. Soon, so much is happening that if you look in the wrong direction, you may miss a choice flight of fancy, such as Mr. Eisenberg’s droll walk on a low wire (the “wire" is a slack clothesline). In 2007 Avner starred in Leland Faulkner’s The King O’Cats, which won four internationally recognized Accolade Awards, Best Children’s film at the New York International Independent Film and Video Festival, and the Maine Short Film Competition.